Or lawless roam around this earthly waste. My Saviour's pathway to His home above. Heaven will o'ercome th' attraction of my birth. He to earth's lowest cares is still awake. To His soul-piercing voice for ever nigh? Where human sorrow breathes her lowly moan. We see CHRIST'S entering triumph slow ascend. Our wasted frames feel the true sun, and live. Age after age, in worthier love and praise. cursing, and the man who sold it to her. sobbing at the kitchen sink. the nothing’s-lacking, the non-cracking up. Jesus came for the sick. and the ones who still don’t know where to begin. for the ones who know we need hope. The last few days have been a whirlwind of catching up with people, administration, communion, preparation for Sunday, meetings and the Burns Supper. Not much time for blogging really. The Burns Supper team did brilliantly last night- good singing and playing, the best recitation of Tam o' Shanter I've heard, some fine speeches, and superb food, all served well. Everyone seemed to enjoy it, for which I'm thankful. A good event that we just might have to repeat next year. 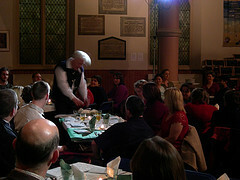 Bill Adair addresses the haggis. We have a Burns Supper at church tonight. He was a flawed man in so many ways, yet has helped imbue Scotland with a certain concern for justice and hatred of hypocrisy. Was he a Christian? The Lord alone knows, though I tend to see him as something of a Prodigal Son. We will remember his work with affection.